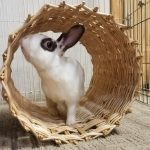 Easter and Rabbits - You Got A Rabbit at EasterHouse Rabbit Connection, Inc. This article was written in 2009 and remains an excellent overview. RICHMOND, CA (April 6, 2009) — House Rabbit Society (HRS) strongly urges parents not to buy their children live “Easter bunnies” unless they are willing to make a 10-year commitment to properly care for the animals. Each year, thousands of baby rabbits, chicks, and ducks are purchased as Easter gifts only to be abandoned or left at shelters in the days, weeks and months that follow Easter. Jazz was adopted in 2017. Most children want a companion they can hold, carry and cuddle, but rabbits are fragile, ground-loving creatures who break easily when dropped. Additionally, rabbits are easily frightened by loud noises. It is unreasonable to expect a small child to make a 10-year commitment to taking care of a rabbit. All too often, the child loses interest, and the rabbit ends up neglected or abandoned. Housing: Bunnies need a roomy indoor cage that is approximately four times the size of the adult rabbit. The cage should not have a wire bottom, as the wire can cause sores on the rabbit’s feet. There should be room for a litterbox, toys, food and water bowls. Playtime: Rabbits need plenty of exercise and should be allowed at least 30 hours out-of-cage running time in a rabbit-proofed area of the home per week. Outdoors: Rabbits should never be left outdoors unsupervised. They can , literally, be frightened to death when approached by predators such as dogs, cats, raccoons and owls. They can also dig under fences to escape. Litter Box: Rabbits, once spayed or neutered, will readily use litterboxes that are place in one corner of the rabbit’s cage; the rabbit’s running space should contain at least one additional box. Use dust-free litter–not the clumping kind, and no softwood shavings. Diet: Bunnies need fresh water, unlimited fresh, grass hay, 1-2 cups of fresh vegetables, and a small serving (1/4 c per 5 lb. rabbit) of plain rabbit pellets each day. Health: Like dogs and cats, rabbits should be spayed or neutered. The risk of uterine cancer in unspayed female rabbits is alarmingly high., and unneutered males are likely to spray. Have lots of time, a household that can withstand some chewing, and a stable residence. Expect an unneutered/unspayed baby will spray urine on the walls. Know that neutering/spaying (at four to six months) will stop the problem. Expect accidents when baby forgets the location of the litterbox. Allow the energetic young rabbit at least 30 hours a week of free time outside her cage.